The North American Leader of High Quality Garage Interiors! Slide-Lok is the North American leader when it comes to providing high quality, long lasting garage interiors. 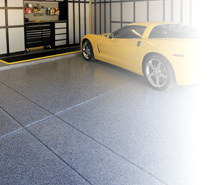 From our industry leading garage floor coatings that are 4x stronger than epoxy garage floors and that can be completed in a single day, to our Slat-Wall and Overhead Storage solutions, to our best-in-class, plywood garage cabinets, Slide-Lok garage interior solutions are always the right choice!